These quick and easy recipes all feature delicious German salamis, sausages and hams. 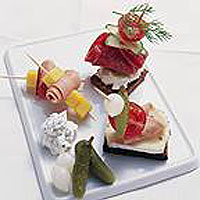 Two of the recipes use Quark, a soft, smooth textured cheese made with fresh Bavarian Alpine milk. The Orchard Dairy variety used is virtually fat free (0.2 per cent), and is great for topping jacket potatoes, in cheesecakes, sauces or with fresh fruit. It is also suitable for vegetarians. To prepare the stacks, roll up a strip of ham or salami and place a cube of cheese on either side. Secure with a cocktail stick.